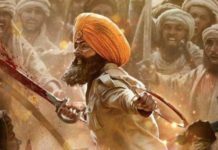 Anurag Singh’s Kesari has hit the screens with heavy footfalls. The film features Akshay Kumar and Parineeti Chopra in the lead roles. So does Kesari provide enough entertainment and patriotism? Let’s find out in our Kesari Movie Review. Kesari is based on true events, about a group of brave-hearted Sikh soldiers battling against ten thousand Afghans robust army. These Sikh soldiers are positioned in the 36 regiments located in Saragarhi which is lead by Havildar Ishar Singh (Akshay Kumar). Later, it shows the soldiers witnesses a woman about to get killed by a group of Afghans. Despite the British officer advising him to not get involved, Ishar attacks the Afghans and saves the lady. As a punishment, Ishar is transferred to Saragarhi Fort, considered as a place where ‘nothing happens’. Ishar Singh arrives there and realizes that the 20 Sikh soldiers posted in the fort as part of the 36th regiment. Ishar attempts to punish them but realizes that they have feeling towards each other. Meanwhile, many Afghan tribe leaders gather and decide to attack the Saragarhi, Gulistan, and Lockhart Fort to defeat the British. The Afghans are aware that there are few of Sikh soldiers in Saragarhi and they would easily lose the battle. Afterward, Ishar Singh and the others in the fort get shocked as around 10000 Afghan’s stand outside the gate of the fort and all set to attack. But, Sikhs are unable to get any help as the Afghans have destroyed all routes to Saragarhi. Ishar asks his soldiers that fighting so many people will be deadly. However, The soldiers refuse to leave and decide to fight and die. What happens next forms the rest of the film. The film has a piece of patriotic music which arise goosebumps. Also, Manoj Muntashir does spread a lot of magic in the songs with his lyrics and one of my favorites is Teri Mitti. Whereas Punjabi singer B Paraak has made his debut in Bollywood as a playback singer with Ae Meri Zameen. In this film, most of the Punjabi singers have written and composed the music. On the other hand, Arjith Singh and Asses Kaur has sung Peeche Peeche a romantic song. The overall music is groovy with meaningful lyrics. Well, Akshay Kumar has done many patriotic films putting his fans amazed. With the vigorous acting of Akshay Kumar in the film makes worth watching. 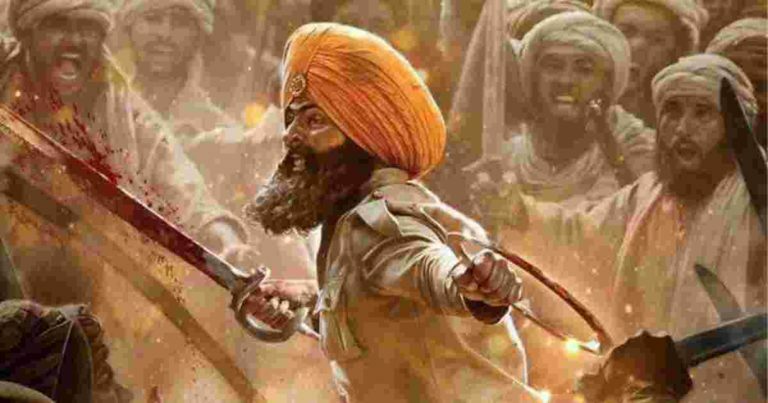 Kesari starts with action and establishes Ishan Singh’s righteous character right from the beginning of the film. But, this action scene does not extend to the first half. However, the first half of the film is relaxed and provides ample entertainment. But, Parineeti Chopra has appeared in a few scenes which are hardly a 10 minutes role. 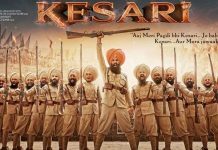 In Akshay Kumar’s collection of films, Kesari could surely rank among one of his excellent performances and possibly his biggest blockbusters. You must watch this movie as it represents the most memorable battle in history. The film is something which you didn’t have studied in your school times. Akshay Kumar is the soul of the film and he is absolutely outstanding with his look and acting. The film is good and a must watch a film. The acting, narration, dialogue, and music is excellent. If you really want to watch this film go and watch in your near theatres to get a true experience. 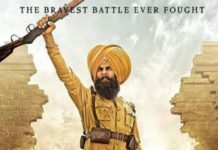 Kesari Movie is a worth watching Bollywood Movie highlights about the war between 21 Sikh against 10000 Afghani's. Whereas, the movie has amazing songs as well as action scenes which makes the movie a complete package. There's no doubt that this movie must be watched with their Friends and Family.